Defiance has made the trailer rounds here for a number of months, showing a San Francisco Bay Area shuddering beneath an alien invasion as a narrative tie-in to the upcoming SyFy channel TV series. Today, Trion announced that the MMO third-person shooter is out now on Steam —for a steep $60, you'll join the rest of humanity's defenders in recovering alien tech while squashing exploding bugs. Our latest preview goes over Defiance's details, but here are the basics: Your character is defined by a flexible "origin" background instead of standard classes, so you're free to mix up preferred weapons and abilities as you see fit; you'll walk, sprint, and drive around San Francisco's blasted remains in search of Arkfalls, pieces of an alien ship falling out of the sky and totally throwing off the Bay's feng shui. Arkfalls might sound mechanically familiar, and you'd be right—they're modeled after the large-scale dynamic events of Trion's previous MMO, Rift. 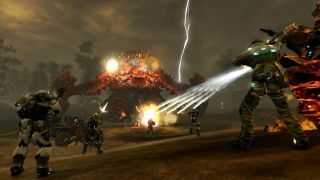 Trion has stated that the game and TV show will heavily influence each other with major shared events. If anything, the ambitious cross-media undertaking should bring in regular content updates guided by the show's developments, at least as long as it's still running. Incidentally, the Bay is where PC Gamer's US offices reside, but worry not—we're well-armed for the onslaught.